If you are behind on your student loans and live in Houston, you could be arrested. That's right, the U.S. Marshals Service in Houston is arresting people who have outstanding, unpaid federal student loan debt. 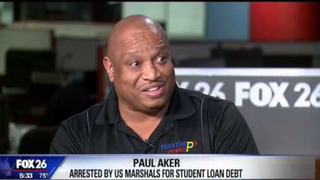 Houston resident Paul Aker told Fox 26 that seven deputy U.S. marshals showed up at his home with guns over a $1,500 federal student loan he took out in 1987. He says he was taken to federal court where he signed a payment plan to repay the 29-year-old debt. Texas Democratic Rep. Gene Green told the news station that "the federal government is now using private debt collectors to go after those who owe student loans." Green added that as debt collectors get judgments in federal court, U.S. marshals are being asked to arrest those who have failed to pay their federal student loans. According to Fox 26, a source with the U.S. Marshals Service in Houston said that marshals may serve "anywhere from 1,200 to 1,500 warrants to people who have failed to pay their federal student loans." Read more at Fox 26.